Ixodes hexagonus is a tick species in the genus Ixodes. It is a parasite of the European hedgehog. Characteristically the female adult Hedgehog tick have a heart shaped scutum. The scutum of males covers the entire idiosoma. Another characteristic feature the humped tarsus on the first leg pair. In colouration they are a dark brown. There is a distinct lateral groove, festoons are sometimes apparent. It occurs throughout the United Kingdom, sparsely in the North West, increasing in density to the South East. Although it does not usually occur on rodents or birds, and is "described as a nest-dwelling hedgehog specialist. It is also found on foxes, mustelids (including badgers), dogs and cats." I. hexagonus is found throughout western Europe as far east as Siberia. It is widespread over this area. It is closely associated with its principal host the hedgehog. I. hexagonus is endophillic; it is predominately a nest based parasite. It spends most of its life in the nest of the main hedgehog host. Thus it is buffered from the environmental conditions experienced by many other free ranging ticks such as I. ricinus. The Hedgehog Tick is a potentially important reservoir for Borreliosis, the causative agent of Lyme disease. Studies indicate that both hedgehogs and I. hexagonus harbour Borrelia. I. hexagonus may act as an important vector of Lyme disease, transmitting it from hedgehog hosts to other small mammals. Thus ultimately it may spread to large mammals and humans. I. hexagonus may be important in sustaining Lyme disease in urban location where hedgehogs are a frequently found small mammal. ^ "Tick distribution map: Ixodes hexagonus". Health Protection Agency. Retrieved 29 August 2014. 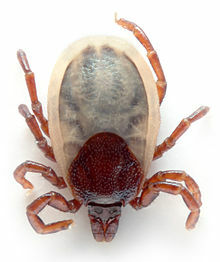 ^ "Ixodid Ticks: Family Ixodidae". influentialpoints.com. Retrieved 29 August 2014. ^ Walker, Mark David (11 April 2018). "The hedgehog tick, Ixodes hexagonus (Leach, 1815) (Acari: Ixodidae); The natural history and ecology of a nest ectoparasite". Systematic and Applied Acarology. 23 (4): 680. doi:10.11158/saa.23.4.9. This article about a mite or tick is a stub. You can help Wikipedia by expanding it. This page was last edited on 20 May 2018, at 17:16 (UTC).